Łódź first appears in written records in 1332 under the name of Łodzia. In 1423 King Władysław Jagiello grants city rights to the village of Łódź. The town remains no more than a rural backwater for the following centuries, with a population numbering just 800 as late as the 16th Century. After the Great Northern War (1700-1721), Poland is more or less absorbed into the Russian Empire. The country will suffer through three humiliating partitions in the latter half of the century. In 1793 the second partition of Poland sees Łódź come under Prussian control and renamed Lodsch. Napoleon’s march eastward sees his army greeted as liberators and in 1806 the town is incorporated into the Duchy of Warsaw. Napoleon’s subsequent disastrous campaign in Russia sees his troops return to France in tatters and in 1815 Łódź becomes part of the Russian-controlled Congress of Poland. In 1820 statesman, philosopher and writer Stanisław Staszic starts a campaign to turn Łódź into a centre of manufacturing. The first cotton mill is opened in 1825 and in 1839 the first steam-powered factory in Poland and Russia is officially opened. A massive influx of workers from as far afield as Portugal, England and France flood the city, though the mainstay of the town’s population is made up of Poles, Germans and Jews. Within a matter of decades the city has grown into the biggest textile production centre in the Russian Empire. In 1850 the customs barrier between the Congress of Poland and Russia is abolished, a move which sees Łódź’s economic influence grow further. By 1870 the population has mushroomed in size to over 70,000. The city enjoys its most intense industrial growth between 1870-1890, during which time vast fortunes are made by the major industrialist families. Dissatisfaction amongst the working classes grows, and the city becomes a hotbed of socialist unrest. 1892 sees massive strikes grip the city. The huge gaps in living standards between the rich and the poor come to a head in 1905 when the city is plunged into open revolution. Over 300 workers and protestors are killed as the Tsarist police force regain control of the city. By the outbreak of WWI Łódź rates as one of the most densely populated cities on the planet with a population of approximately 13,000 people per square kilometre. 1915 sees the city come under German occupation though three years later the end of the war restores Polish independence. The city loses nearly over 40% of its population owing to the post-war worldwide influenza epidemic and a huge social migration of its German inhabitants. 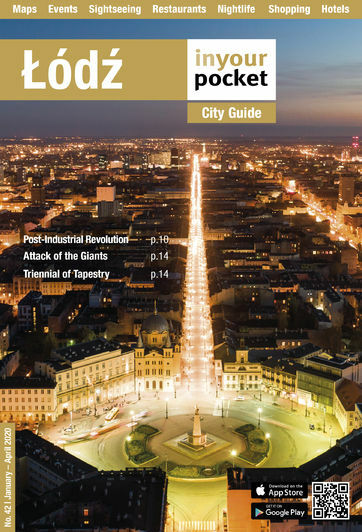 In 1922 the city becomes the capital of the Łódź Voivodship but the city’s golden age has drawn to a close. Łódź’s textile trade faces collapse after losing both Russian and German markets and strikes and civil unrest become a feature of inter-war Łódź. In 1939 World War II begins when Nazi Germany launches an attack on Poland’s military posts on Westerplatte (now part of Gdańsk). Łódź holds out until September 8 and is annexed into the Reich in November of the same year. The northern part of the city is turned into a ghetto, with approximately 200,000 Jews confined within its walls, of which only around 900 are thought to have survived the ghetto’s liquidation in 1944. The city is liberated on January 18, 1945 by the Red Army. The pre-war population is decimated with an estimated 300,000 Jews and 120,000 Poles killed during the six years of occupation. From 1945 onward Poland falls under the Soviet sphere of influence. With much of the capital, Warsaw, in ruins, Łódź is used as Poland’s temporary capital until 1948. In 1947 the Communists consolidate a political monopoly after rigged elections. Businesses are nationalised including huge factories in Łódź most considerably the Manufaktura complex which was renamed Poltex. The emphasis on quality, which had been the hallmark of Łódz's textile industry, was replaced by an emphasis on quantity and most of the goods produced here - primarily cotton - were shipped off to the Soviet Union. In 1955 the Warsaw Pact is created which opened up trading within the COMECON block and once again production began to boom in Łódź. left it without any real market, factories closed and production fell. The late 1970s witness a dramatic drop in living standards however and prices start spiraling ; a half-mad economic policy propped up by foreign loans is exposed as useless. 1978 sees Cardinal Karol Wojtyła elected as Pope and taking the name John Paul II. The following year he returns for a nine day tour of his native Poland in what is regarded by many as the pivotal point in the collapse of communism. Preaching 32 sermons in nine days his brief return offers hope and unity to Poles, and lights the flame that will later explode in the Solidarność (Solidarity) revolution which catches fire in Łódź as well. 1980 A general strike is called in August by the fledgling Solidarność trade union, led by shipyard electrician Lech Wałęsa. 1981 Martial law is declared by the Minister of Defence General Jaruzelski on December 13. 1982 Solidarność is outlawed by the government. 1983 Martial law is lifted in July and most political leaders released from prison. Lech Wałęsa receives the Nobel Peace Prize. 1985-88 Soviet leader Mikhail Gorbachev’s perestroika reforms initiate a period of liberalization, though economic crisis and popular frustration continue to deepen. 1989 Following more strikes Solidarność is legalized. Partlyfree elections are held. Solidarność sweeps the elections and the Communist regime collapses. 1990 Lech Wałęsa becomes the first popularly-elected president of post-Communist Poland. 2005 Following a long battle against illness Pope John Paul II passes away. An estimated one million Poles descend on Rome for his funeral. Solidarity veteran Lech Kaczynski wins the Presidential vote shortly after his party PiS had won the general election. When his twin brother Jaroslaw becomes Prime Minister in a cabinet reshuffle some months later, the Kaczynskis become the first twins to hold both key posts in a democracy in history. 2006 The Manufaktura shopping and leisure complex opens to international acclaim, marking the city’s social and economic renaissance. 2010 Poland is plunged into national mourning after a plane carrying Lech Kaczyński and 96 other high ranking politicians, dignitaries and high-ranking military figures crashes outside Smoleńsk.